Calabria ethnic linguistic minorities: the Greeks, the Waldensians and the Albanians. For centuries Calabria has given refuge to groups of people from different religious beliefs, and its woodlands and mountains have become for many, a permanent home. The region has now three large ethnic-linguistic minorities: the Greeks, the Waldensians and the Albanians. • The Greek-speaking Calabria (or grecanico), spoken in the triangle grecanico (Amendolea (Amygdalia / Amiddalia), Bova (Vua), Bova Marina (Fundaca, Jalo to Vua), Chorio of Roghudi, Condofuri, Condofuri Marina, Gallicianò, Roccaforte del Greco (Vuni), Roghudi old (Richùdi), uninhabited, new Roghudi . The Greeks live in the farthest mountainous part of South Italy, the wildest area of Calabria, in the southernmost part of the peninsula, corresponding more or less to the towns of Bova, Condofuri, Roccaforte del Greco and Roghudi. According to Gerhard Rohlfs, professor at the the university of Tubingen, who has studied the dialects of this area for some 50 years, their origin go back to Magna Grecia. Others hold that the Greeks here are of Byzantine origin ( 6th-7th centuries AD). Essentially herders and farmers in isolated territory, they still speak Greek and have conserved many interesting customs and traditions. After a long period of emargination, these descendent of the Greeks have in the past few years enjoyed a degree of cohesion, while the Calabrian themselves now recognize the importance of protecting this minority. It is now hoped that the language, their most vital patrimony, which the younger generation is now beginning to forget, will be preserved. An outstanding craft, still carried on here in these communities, is the wood-carving,reproducing themes from primitive cultures as well as those from Byzantine, and fabrics are woven from the broom plant. Bova, the chief town, has important monuments and, each year in June, a community arts festival is held there, with singing dancing and drama. The Waldensians ( or Provençal) settled near present-day Guardia Piemontese a few km north of Paola, in Cosenza province, and well known for its spa of the same name. The Waldensians live at Guardia on top of a mountain facing the sea, and originally came to Calabria in about the 12th century ( they once had settlements also at Mormanno, Vaccarizzo and Montalto) to escape religious persecution. Unhappily, their new home was not far enough away from their native land ( the Pellice and Angrogna valleys, between Piedmont and Liguria ) for safety. The Neapolitan Inquisition caught up with them and almost wiped them out. The survivors still mantain their old customs and distinctively Piedmontese dialect and accent. At Guardia Piemontese still a mediaeval town, the ' gate of blood ' stands to remind one of the slaughter perpetrated by Cardinal Ruffo's soldiers. 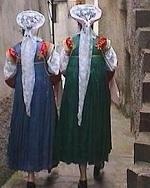 The Albanians are the most numerous of the ethnic minorities in Calabria. They too came here to escape religious persecution after pressure exerted by the Arabs in the Balkans, present-day Albania. The first wave of Albanians arrived in Calabria in 1448 and then settled in a number of towns in the province of Cosenza, founding others. This area corresponds to the hills which surround the Plain of Sibari on the north, south and west. The Albanians are a closely knit community. They all speak their language fluently and have an autonomous religion with their own bishop (eparch) and seminary, of the Greek Orthodox rite. The religious ceremonies are very impressive , especially the marriage ceremony, during which the couple is crowned severel times. The most important centres of the Albanian community are Longo and San Demetrio Corona. The Albanians of Calabria have their own literature which reached a very high level in poetry with Giorgio Variboda, born at San Giorgio Albanese in the first half of the 18th century. The whole tradition, as can be seen in their weaving, costumes and choir singing recalls their national hero Scanderberg, to whom numerous monuments have been erected in the province of Cosenza. It is worth going to an Albanese 'vallie' when the whole community meets with songs and dances for an entire day, dressed in their wonderful traditional costumes.